The deadly Ebola outbreak in the Democratic Republic of the Congo is spreading towards a city home to one million people. Cases have begun appearing in a district between the two major cities involved in the epidemic, suggesting the virus is spreading south. If Ebola does make it to the major city of Goma then 'all bets are off' for the bid to control the outbreak, one health official said. A total of 419 people have died in the killer outbreak already, with the DRC's health ministry reporting 685 cases. The health ministry reported on Friday that there had been four Ebola cases confirmed in the town of Kayina. 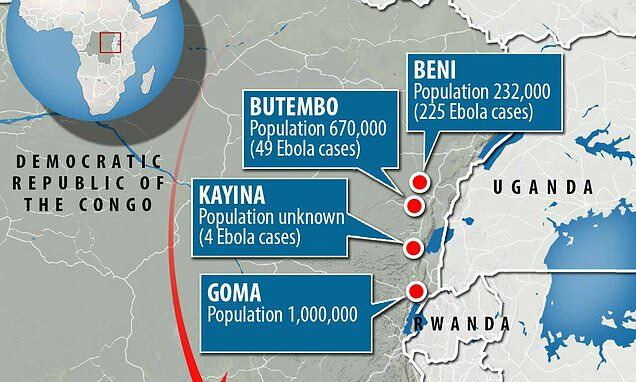 The area is halfway between the cities of Butembo, where people are already dying of Ebola, and Goma, where experts fear it could wreak havoc. Goma has almost double the population of Butembo, meaning there is a much higher potential for the virus to spread quickly. And Goma sits on the border with Rwanda, adding an extra threat of Ebola spreading out of the country. 'These are crossroad cities and market towns,' Dr Peter Salama, head of the World Health Organization's Health Emergencies Program told Vox. He said the contagious illness spreading in areas where people are constantly travelling in and out 'raises the alarm'. The WHO and DRC's health ministry have already sent rapid response and vaccination teams to Kayina, and they've set up a lab in Goma as a precaution. What Gave Him Such Confidence? When we sin against other people, our natural response is to distance ourselves from them. A La Carte (April 19) There’s a nice little list of Kindle deals for you to go through today if you’re into that kind of thing. Cities and countries aim to slash plastic waste within a decade If all goes well, 2030 will be quite a special year.